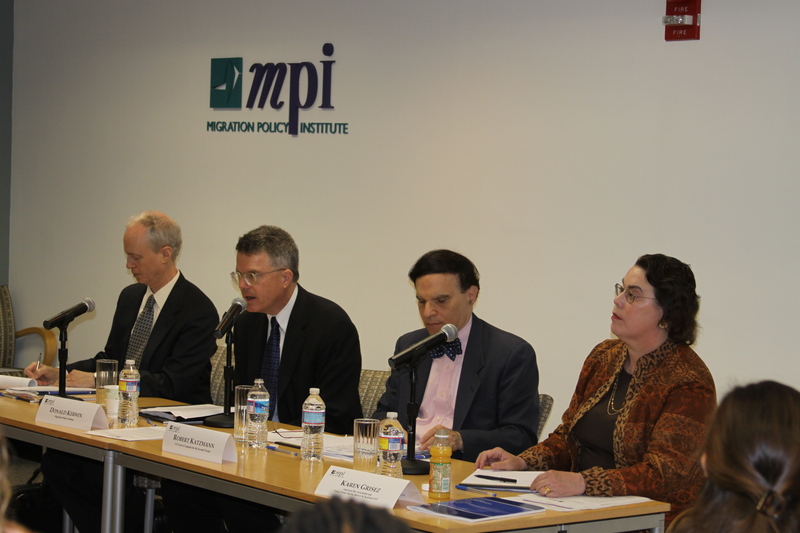 During this briefing at MPI, panelists discussed possible reforms to the immigration adjudication system and a recent ground-breaking report on the topic by the American Bar Association’s Commission on Immigration. The event was moderated by MPI Vice President for Programs Donald Kerwin, and the panelists were: Robert A. Katzmann, US Circuit Judge, US Court of Appeals, Second Circuit; Karen T. Grisez, Chair, ABA Commission on Immigration; and Lawrence A. Schneider, Senior Partner, Arnold & Porter LLP, who led the ABA report research team. This panel discussion, held in conjunction with the awards ceremony for the 2010 E Pluribus Unum Prizes for exceptional immigrant integration initiatives, examines the federal role in immigrant integration policy more broadly, focusing on areas where greater coordination and funding appear to be needed. The panel’s moderator was Michael Fix, MPI Senior Vice President and Co-Director, National Center on Immigrant Integration Policy, and panelists included Felicia Escobar of the White House Domestic Policy Council and Department of Housing and Urban Development Assistant Secretary John Trasviña. Receiving an honorable mention: McDonald’s Corporation, for its “English Under the Arches” program. The ceremony was opened by MPI President Demetrios Papademetriou, and Assistant Attorney General Tom Perez, who oversees the Justice Department’s Civil Rights Division, provided remarks. The award presenters: Michael Fix and Margie McHugh, Co-Directors of MPI’s National Center on Immigrant Integration Policy, which administers the prizes program. Congressman Mike Honda also spoke, and the ceremony was closed by Brad Davidson, a trustee of the J.M. Kaplan Fund, which provides generous support for the E Pluribus Unum Prizes. During this panel discussion held in conjunction with the 2010 E Pluribus Unum Prizes, which the Migration Policy Institute bestows annually to four exceptional immigrant integration initiatives, several of the prize winners and other experts examine the adult literacy/ESL instruction, workforce preparation, and community financial services fields. Among the questions discussed: Whether federal policy and funding appropriately support immigrant integration goals in these fields. The discussion was moderated by Margie McHugh, Co-Director of MPI’s National Center on Immigrant Integration Policy.